Special soundhole design gives you more volume and resonance. The Forte Port X starts with the Michael Kelly Port Technology. This fine-tuned combination of bracing and an offset soundhole placement works great with this all-quilt maple body. The Forte Port X's also features a custom Forte Celtic Knot on the 12th fret with Mini Dots, black triple-ply binding, a dual action truss rod and a fast black nylon nut. Acoustic guitar design has not changed significantly since the pre-World War II era. For several years now, the Michael Kelly team has been working on a fresh new approach to acoustic guitars. This has culminated with the development of the new Port Technology. 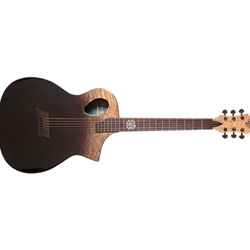 At the core of this innovation is an offset soundhole approach coupled with an all new bracing design. Traditional soundhole placement interrupts a potentially potent “soundboard” area located between the neck and the bridge. By relocating the soundhole, Michael Kelly was able to bring this area to life, providing a louder and more resonate overall top performance. This performance enhancement is especially evident on models with integrated electronics where the added resonance collaborates with the bridge-mounted piezo for undeniably better results. Not just a guitar. It's also a work of art. Order today!